New to Radiesse - See Introductory offers below! St. Lucie’s #1 Provider of Radiesse Dermalfiller. 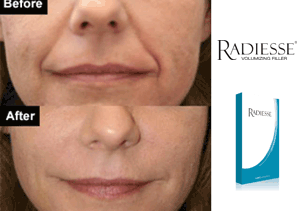 RADIESSE volumizing facial filler can have you looking years younger by reducing not only lines and wrinkles but by adding back lost volume to facial hollows – and it takes no longer than a lunch break. You see the great results immediately and you get to enjoy the age-defying results for up to two years for many patients. * The long-lasting effects of Radiesse can lessen the need for re-injection, which can save you both time and money compared with other fillers in the long run. It also comes in a 1.5 Ml syringe (compared to a Restylane 1Ml and Juvederm .8 Ml) giving it more value. Radiesse dermal filler is made of calcium-based microspheres suspended in a water-based gel. Our professional injectors Ryan Brown PA-C, Jessica Packwood PA-C, and Krystal King ARNP have trained under top experts and have years of experience, so your Radiesse injections will be performed by the hands of true experts and artists. RADIESSE dermal filler is the ideal choice for total facial contouring. It can restore a healthy, youthful appearance, enhance your existing features, help you defy age and gravity, and increase your confidence – all without invasive surgery or scarring. Another unique feature of Radiesse is the length of time the effects of the injections remain. In most cases, the youthful look of facial restoration from this treatment last 1-2 years. Although some individuals prefer a more temporary correction of facial imperfections, others find this quality to be highly desirable. FDA approved1 to mix with lidocaine to significantly improve comfort during procedure.